In the last year, metal stamping, embossing, and embellishing has become a new technique that is catching on with jewelry hobbyists. The saying that "everything old is new again" is entirely true in the fashion industry. This includes making jewelry. In the last year, metal stamping, embossing, and embellishing has become a new technique that is catching on with jewelry hobbyists, yet is it really one of the oldest ways to decorate metal. Metal stamping is the act of taking a steel or harder metal tool, called a punch tool, that has a shape that sticks out from the surface, then hammering that into metal so that the design indents the metal. The most common stamps are letters and numbers which you can see on soldiers' dog tags, and many other common metal tags. With the trend in fashion design looking to vintage and history for ideas, metal stamping has become the hot new jewelry look, and it is very easy to do in your own home or studio. GROBET FILE CO. OF AMERICA, INC.
Metal stamping tools and supplies are quite reasonably priced. It is worth your while to buy a good rawhide hammer, because once you buy one, you will never need to replace it unless you give it to someone else. Your metal block will last almost forever. You would have to be quite strong to damage it. Punch tools also last quite a while and usually only need to be replaced if they get lost. The main cost of metal stamping is when you stamp a precious metal like silver or gold. That can get expensive. 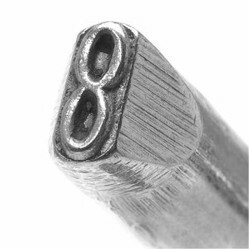 Most people like to stamp letters, and numbers, for names and dates into their metal items. It makes sense then to buy a set of letters and numbers. There are basic sets, and also more extensive stylized sets. After that you can find design sets, or single designs on most jewelry websites. Amazon has a good selection, but if you want to see even more then Delphi Glass has a specialized collection of punch tools, punch tool kits, and instructional DVD's. Delphi can also give you over the phone or email help and answer questions if you are new to metal stamping, about how the tools work, and which is better for a specific need. Once you get started, and you fall in love with the design look of metal stamping, then you can amass an extensive collection of punch tools with varying designs. 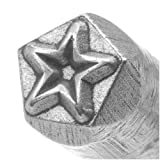 If you do your research, you can find a wide range of punch tool shapes good for any project. Or you might find that only a few will fit the designs you are making, and you will experiment with other design techniques. One great thing about using metal stamping tools is that they will work with just about any kind of metal. You do need to remember that some metals are much softer than others, and gently tap your punch tool with your rawhide hammer until you are sure how hard you need to tap. Most precious metals are soft, including silver and gold which makes them easier to work with, but metals also come in different hardnesses for jewelry making. So you can buy half hard copper, and brass that make it easier to hammer and stamp. This article is an introduction to the various types of clasps that you can use in jewelry design, and the pros and cons of each clasp.